Johnny Owens is former Chief of Human Performance Optimization at the Center for the Intrepid (CFI), which is part of the SAMMC–Department of Orthopaedics and Rehabilitation (DOR). Johnny was at SAMMC for 10 years, treating service members suffering severe musculoskeletal trauma. His successes included the application of regenerative medicine for volumetric soft tissue loss and Return to Run Clinical Pathway, an internationally recognized rehabilitation program designed to combat delayed amputations and compliment a dynamic exoskeleton, the IDEO. He took part in numerous multi-center research projects involving regenerative medicine, sports medicine and rehabilitation of the combat casualty. Johnny Owens has been applying Blood Flow Restriction Training clinically since 2012 and credits the modality with significant strength recovery in more than 300 patients. Owens has been published extensively in the peer-reviewed literature and his work has been featured on 60 Minutes, Time magazine, NPR, Discovery Channel and ESPN. 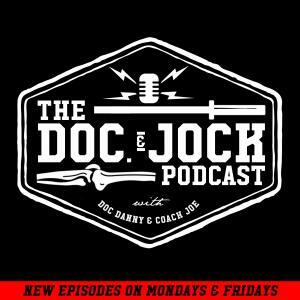 In Episode 68 of the Doc & Jock Podcast co-hosts Doc Danny Matta and Coach Joe Szymanek sit down with cutting edge physio-coach Johnny Owens to talk Blood Flow Restriction and how he uses it with almost every professional athlete on the planet to reduce recovery times and increase performance. If you aren’t familiar check out this piece that ESPN’s Outside The Lines recently did with Johnny http://espn.go.com/video/clip?id=espn:15162497 .